P.D. James died last week, “peacefully at home in Oxford,” at age ninety four. But I’m sure you know this already. She was one of a kind. A seemingly gentle, charming and erudite woman who loved to talk and wonder and write about death. Violent death. I love Elizabeth Renzetti’s remark in her Globe and Mail article, in response to the press release that James had died peacefully…. “Peacefully. You have to laugh. It’s not like she was ever interested in peaceful deaths- death by hanging, and stabbing and poison, yes.” Renzetti, who interviewed James several times over the years, remembers her fondly… even reverently. You can read her full article here. Yep, P.D James was a wonderful writer. Her settings are evocative, her characters believable, well drawn and interesting to “get to know,” and her plots well-constructed. But, to me, it’s her style that elevates her work. Her writing is so elegant, and her style so graceful, that you read it effortlessly. She makes good writing, which is very hard to do, look easy. If you’ve ever read crime/detective/mystery fiction you’ve probably read P.D. James. And if you’ve not read her, but read other crime writers and, as a result, have underestimated crime fiction or dismissed it as a lesser genre than, say, literary fiction, you should definitely read P.D. James. 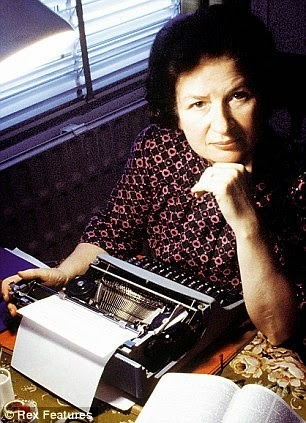 As she said herself: “It’s perfectly possible to remain within the constraints and conventions of the genre and be a serious writer, saying something true about men and women and their relationships and the society in which they live.” She certainly demonstrates this in her novels. 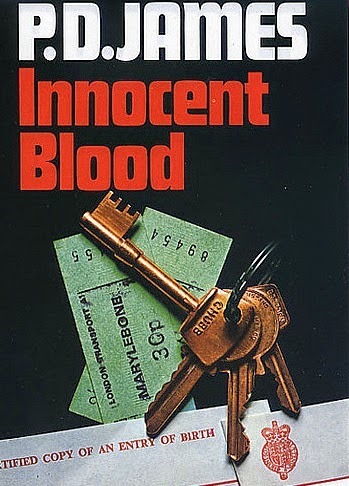 Innocent Blood her eighth novel and the first to hit top the bestseller lists in the U.S.
I’ve been reading detective novels, and P.D. James, for years. I probably borrowed my first book of hers from my grandmother who loved reading in general, and crime fiction in particular. 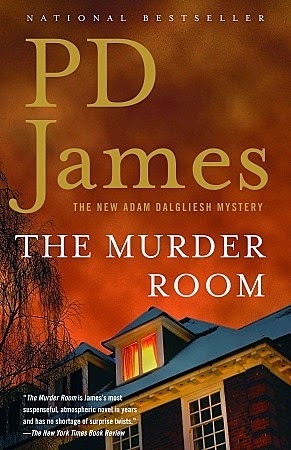 I think that my favourite book in James’ Adam Dalgliesh series is Murder Room. I loved the setting- on the edge of Hampstead Heath in London, in the fictional Dupayne Museum, in a fascinating room that chronicles murders from times past. I agree with my friend K. that setting is often like another character in James’ novels, and that’s particularly true in this book. But as much as I like the Dalgleish series, it’s an older novel of James’ that is closest to my heart. 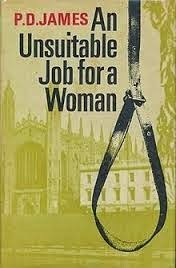 I simply loved An Unsuitable Job for a Woman when I first read it back in the eighties. And the sometimes hapless, always resourceful, trainee-detective Cordelia Grey is my favourite James character. I also enjoyed reading James’ non-fiction work on the history of detective fiction, and subsequently found and read several of the authors she explores in her book. James certainly was the doyenne of the crime fiction world. “Queen of Crime Fiction” as Shelagh Rogers called her in a 1990 interview, in which James relates how she and Ruth Rendell laughed at the fact that they had both been awarded that title over the years. You can listen to Shelagh Rogers’ interview with James here, as well as one with Peter Robinson in which he talks about P.D. James, and another with James herself on Jane Austen and her last book Death Comes to Pemberley. If you haven’t read Death Comes to Pemberley, you should. My goodness, what’s not to love about this book? Jane Austen’s characters lovingly brought to life six years after the end of Pride and Prejudice to deal with a mysterious death in their midst. All masterminded by P.D. James, the mistress of detective fiction and lover of all things Austen. So, with P.D. James gone… who will vie for the title “Queen of Crime Fiction?” Or will Ruth Rendell rule all on her own? I asked my well-read, mystery-loving friends S. and K. and J. that question. And then I whittled the ensuing list down to five. -Deborah Crombie for her Duncan Kincaid and Gemma James series. I particularly loved last year’s The Sound of Broken Glass, set in the Crystal Palace area of London and dealing with the fascinating history of the area, along with the murder, of course. -Minette Walters whose books we eagerly anticipated after devouring her first novel The Ice House in 1992 . My two favourites of hers are Scold’s Bridle and The Shape of Snakes for their brilliant plot structure. But we haven’t heard from Walters since 2007. Hopefully she hasn’t given up on the crime genre. Minette, Minette…. please, do not abandon us. -Tana French for her Dublin Murder Squad series. I’ve loved all of these , but Faithful Place, set in the Liberties area of Dublin, is my favourite. -Kate Atkinson for her Jackson Brody series set in Edinburgh. But no matter which writer ascends the throne that P.D. James has so recently vacated, they will have a tough act to follow. James had a tremendously loyal following. I talked about both Tana French and Kate Atkinson in a post a couple of months ago, and I didn’t want to be boring and repeat myself…. so, if you’re interested, you can read that post here. Linking up this week with Thursday Blog Hop. Here, here. She will be missed. Agreed. Thanks for reading, Christy. I love this post because of all your recommendations–not that PD James died…that's sad 🙁 . But I do adore crime/suspensr fiction so I will put her on my to read list. The Pemberley book has been on my radar for a couple years but I have read so many mixed reviews that I kept giving it a pass. I think I will try it soon as my first PD James book. Thanks!! Oh, oh… the pressure is on now. Hope you like the book. I just finished watching Death at Pemberley. I had it pvr'd and did not have time to watch until last night. Not crazy about the way the film handled the ending, but overall I really enjoyed it. Thanks, Brenda. Glad you liked Ann Cleeves. I recently noticed that there is a TV show on BBC Canada based on her Shetland novels. Hope it's as good as those based on her Vera Stanhope novels. 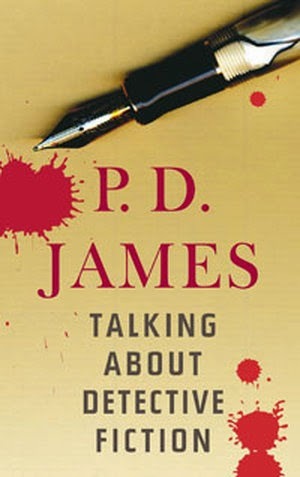 I too love the Cordelia Gray books but sometimes found PD James admirable but a tad too macabre. Liked but didn't love Death at Pemberley and was disappointed by the adaptation's casting: everybody glossy and telegenic except for Elizabeth and Darcy who were, in my opinion, inappropriately plain and unappealing. Many years ago I read and enjoyed the Loretta Lawson mystery novels by Joan Smith. One or two were made for tv and starred Janet McTeer but apparently they were never shown in the US. I'm not familiar with Joan Smith. I'll have to see if I can find them at the library. Thanks for stopping by. Not quite sure why, but I stopped reading James quite a few years ago, although I did love her mysteries for the longest time. I very much enjoyed Renzetti's tribute column (but I've been enjoying Renzetti so much in general lately anyway). I had never read Renzetti's column before this…and I just heard yesterday that she has a novel out this year, which I will definitely look for. Love Susan Hill, like Val McDermid but began to find her Hill/Jordan series getting a bit soap-opera-ish…same for Elizabeth George. Her last book was way too long and some of her characters (like her Deborah St James character) are beginning to annoy me. As for Crombie…I liked her early stuff but her last few books have been really good. I must confess to having BIG British bias when it comes to crime fiction. Thanks for weighing in… I love a good book debate!